My song ‘Across and A Cross’ chronicles the history of a piece of wood. As you can tell from the lyrics, the piece in question was cut from a tree in the spring of 1604 and eventually became part of a trading vessel. After many years at see, the ship is eventually destroyed in an historical event that came to be known as ‘Robert Holmes’s Bonfire’. Weeks after I had written the song, I found out that 2016 marks the 350th anniversary of this event. 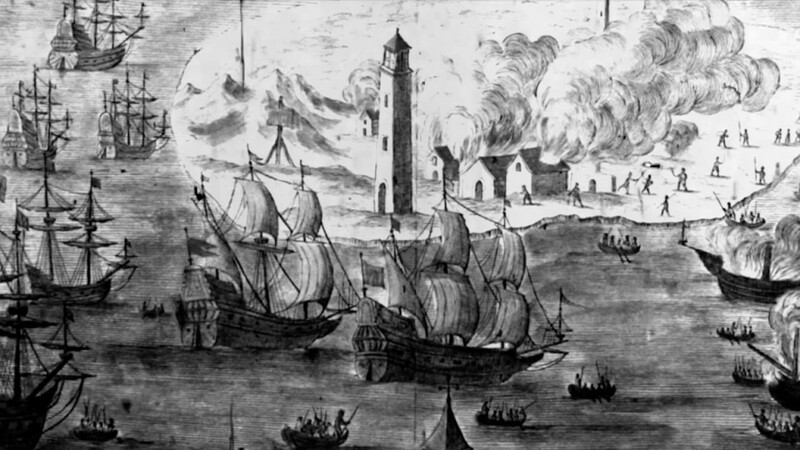 On the 19th of August, 1666, Rear-Admiral Robert Holmes of the British Navy burned down almost a Dutch merchant fleet of almost 140 ships. He also burnt down the town of West-Terschelling, causing an outrage that eventually led to the Raid on the Medway. I’m not going to give you a history lesson here, you can just visit wikipedia if you want to know more. I’ve created a video for the song. I was born and raised in the Zaanstreek, one of the first industrialized areas in the world. In the 17th century, hundreds of windmills lined the river Zaan and a lot of them provided lumber for the shipyards, bolstering the numbers of the fledgling but booming Dutch Republic’s merchant fleet and armada. The mill where you see us perform the song in the opening of the video is a replica of one of those sawmills. The slab of wood shown later on is really from the 17th century and was part of one of the floorboards of my house, a typical ‘Zaans Huisje’ that was built back when they recycled timber from decommissioned ships. I let my imagination wander far and wide when I wrote this song, but it’s not as fictional as you might think.